H all ... I decided to post my new research here. Hope you enjoy. Click link below for a larger clear image. Hi just in case this image needed labeling. Click here for a large clear image. And an old image revisited. Click here for a larger clear image. 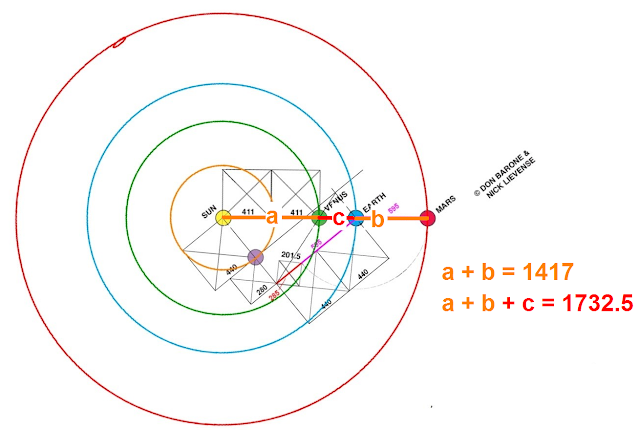 I have continued my study of our solar system looking for an easy way to plot Mars using the diameters of Mercury and Mars itself and came up with this. It is I think ... well you have a look and tell me. Click for a larger clearer image. ASSUMPTION # 1 ... The distance from The Sun to Jupiter is by default 10,000 times the square root of 2 or 10,000 times 1.41421356 or 14142.1356 CUBITS !!!!! It is a pretty simple way to plot the first 6 planets and it is an easy one to remember as well. I have mentioned this before but I think this diagram makes it hit home a little clearer and a little more exciting. 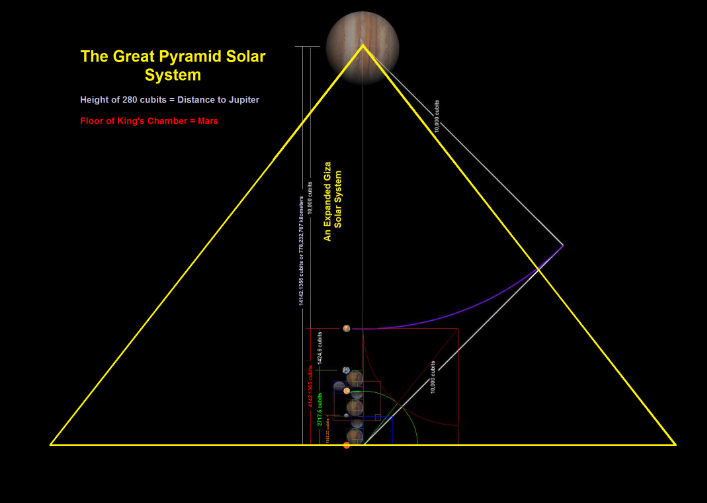 May I present "The Great Pyramid Solar System"
For a much larger clearer image of the above drawing. I was struggling to find an easy way to plot Ceres and then I discovered this. I had already discovered that Ceres is almost exactly 10 times away from The Sun as is the distance between Venus and Earth. Click for a larger image of above. 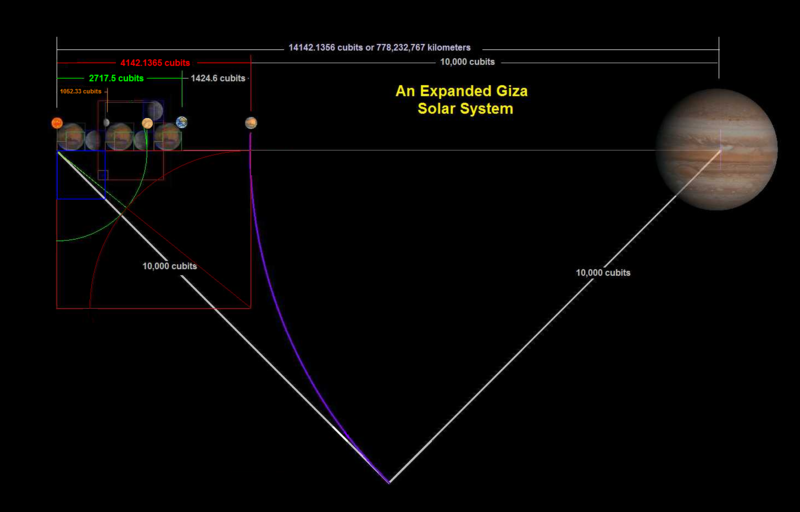 And then realizing that this 1 unit was actually 2/11ths of the distance to Mars ... see diagram below. Click for larger image of above. Cheers and boy they really knew how to keep it simple back in those olden days when Imhotep was building the pyramids. 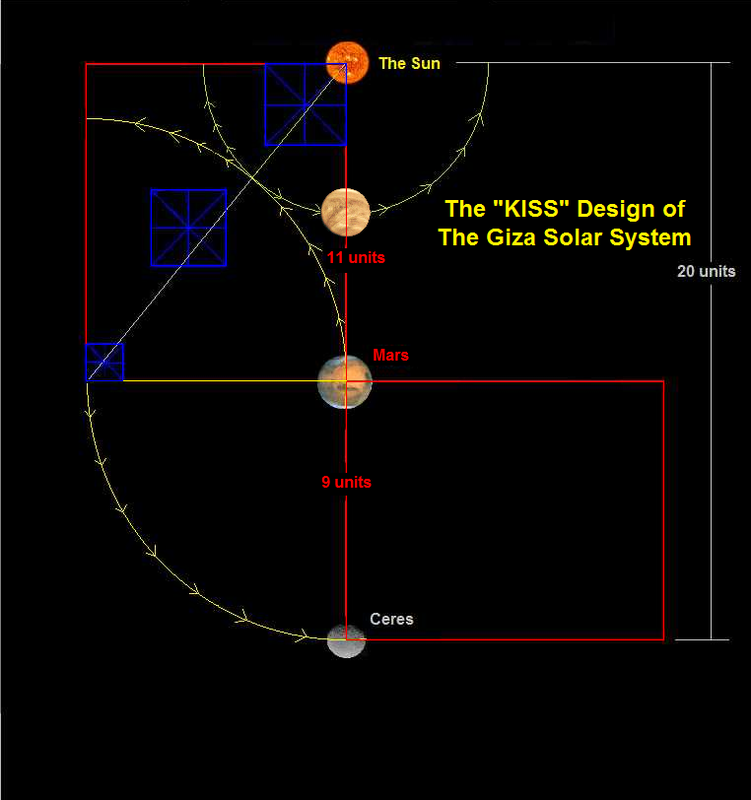 And to make it graphically simple as 1, 2 , 3 , square root that is may I present The Kiss Design of The Giza Solar System. Please note here that using Mars as the origin point and 9 units as a radius we define the place of Ceres. And if we use the opposite point west of Mars at 9 units and scribe an arc to intersect our hypotenuse we have defined the distance to Venus. All in all a very neat, simple way of looking at our solar system and is it any wonder that The Ancients would have known this. Here is a very neat diagram but there is still more. Click for a larger version of above image. We have all seen how the floor of "The King's Chamber" represents the semi major axis of Mars when we allow the height of The Great Pyramid of 280 cubits to equal Jupiter. Here is that image. Mars equals 82.01 cubits. Click here for a larger version of above image. And now a second image. This shows what happens when we show height of The Great Pyramid of 280 cubits equaling the semi major axis distance to Ceres. Here is that image. But you know what these two diagrams can be combined in a most ingenious way and will I think lend credence to my earlier thoughts that The King's Chamber represented Mars for if we do the simple math we find that Mars in the latter diagram in scale is 154 cubits from "The Sun". Now when we combine the two images we see Mars escaping up the shafts and exiting and the 154 cubit point. It is a pretty neat concept to show our solar system and as usual I found it in plain sight at Giza. Below is a flash presentation I put together showing the outcome. And here is the final image. 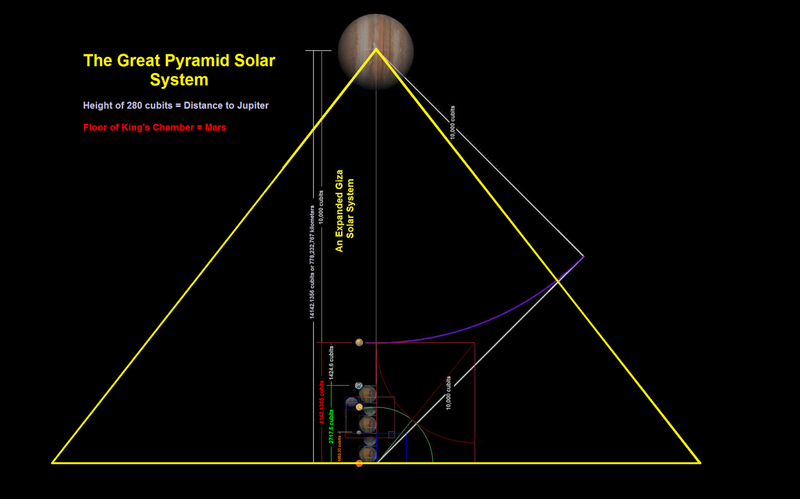 Note how the Great Pyramid and our solar system lends itself to such a simplistic diagram layover. It is very neat. Part II "From The Solar System to Giza"
First Up: Mercury " Messenger of The Gods"
Hi all I hope you enjoyed Part I and if you have not read it may I suggest to get a nice background to this page it would be advantageous to do so. First off let me post the final image from that page again here to see where we left off. 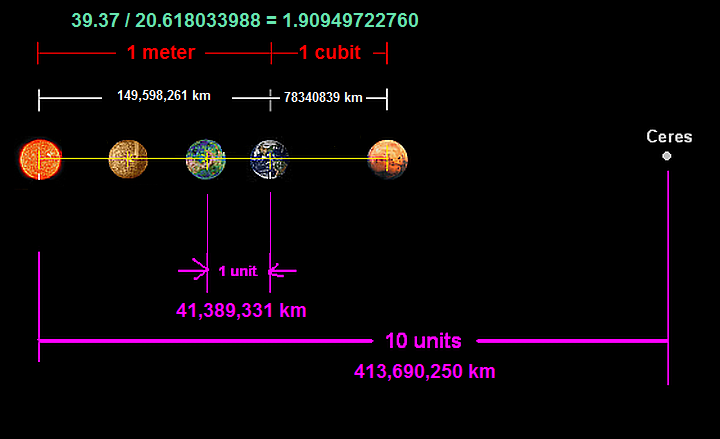 As you can see we very nicely, using the measurements of our solar system and the distances between the four inner planets, discovered that they did indeed give us the correct ratios of the measurement systems we are so familiar with, The Royal Cubit. The Meter and The Megalithic Yard to a degree of accuracy of 99.98 %. But there is still so much more to see. From another of my websites you might remember that I showed how the diameters of all the planets, I excluded Pluto, added up to 10 times Pi or 31.41592659. Here is my diagram for that. Well there is one more measurement we have to add to the top image and that is this fascinating fact. Not only do all the planets total 31.41592659 Earth diameters but if we use this 10 times Pi as inches so that is 31.41592659 inches and allow it to equal a certain solar distance then another agreed upon and well known distance equals the correct number of inches in the ancient Royal Cubit. Allow me to demonstrate. We are going to use the semi major axis of Earth and Mars, that is 149,598,261 kilometers and 227,939,100 kilometers. But let's do the simple math first. I think it is safe to conclude that the ratio of the semi-major axis' of Earth and Mars equals the ratio 10 x Pi to The Royal Cubit. Let's add this to our slowly getting cluttered diagram. All this is very neat, tidy and accurate. Mercury " Messenger of The Gods"
Mercury is the smallest and innermost planet in the Solar System. But heres a question, how did Mercury get its name? Like all the planets, Mercury is named after one of the Roman gods, which were based on the gods worshiped by the Ancient Greeks. The Roman god Mercury was the son of Maia Maiestas and Jupiter in Roman mythology, and most of his aspects were based on the Greek god Hermes. According to mythology, Mercury was the swiftest of the gods, and the one that merchants prayed to for success in their commercial transactions. And Hermes was known as the messenger of the gods in Greek mythology. This is appropriate since Mercury is the innermost planet in the Solar System, and appears to move quickly from night to night. Since Mercury was visible with the unaided eye, most of the ancient cultures had their own name for Mercury. The ancient Babylonians called the planet Napu, after a god in their mythology. The ancient Greeks actually thought that Mercury was two planets, and they called it Apollo when it was visible in the morning sky, and Hermes when it was seen after sunset. But in the 4th century BCE, ancient astronomers realized that the two objects were one and the same, and stuck with Hermes; becoming Mercury with the Romans. Hermes is a god of transitions and boundaries. He is quick and cunning, and moves freely between the worlds of the mortal and divine, as emissary and messenger of the gods, intercessor between mortals and the divine, and conductor of souls into the afterlife. He is protector and patron of travelers, herdsmen, thieves, orators and wit, literature and poets, athletics and sports, invention and trade. In some myths he is a trickster, and outwits other gods for his own satisfaction or the sake of humankind. His attributes and symbols include the herma, the rooster and the tortoise, purse or pouch, winged sandals, winged cap, and his main symbol is the herald's staff, the Greek kerykeion or Latin caduceus which consisted of two snakes wrapped around a winged staff. In the Roman adaptation of the Greek pantheon (see interpretatio romana), Hermes is identified with the Roman god Mercury, who, though inherited from the Etruscans, developed many similar characteristics, such as being the patron of commerce. ""Thoth was called in the Pyramid Texts' He who reckons the heavens, the counter of the stars and the measurer of the Earth', the inventor of arts and sciences, scribe of the gods, the 'One who made calculations concerning the heavens, the stars and the Earth'. As the 'Reckoner of times and of seasons', he was depicted with a symbol combining the Sun's disk and the Moon's crescent upon his head, and - in words reminiscent of the biblical adoration of the Celestial Lord - the Egyptian inscriptions and legends said of Thoth that his knowledge and powers of calculating 'measured out the heavens and planned the Earth'. His hieroglyphic name Tehuti is usually explained as meaning 'He who balances'. Heinrich Brugsch (Religion und Mythologie) and E. A. Wallis Budge (The Gods of the Egyptians) interpreted that to mean that Thoth was the 'god of the equilibrium' and considered depictions of him as 'Master of the Balance' to indicate that he was associated with the equinoxes - the time when the day and the night were balanced." But I digress a bit so back on track. I have found that Mercury that closest planet to The Sun should have been called Thoth because it has placed where it is to measure the solar system for us. And it is a messenger of The Gods but in this case The Gods are the planets and Mercury, Hermes, Thoth are giving us the measurements of The Gods and that is the message they are delivering. Farfetched ? Not so and I have a boatload of facts to back up my hypothesis. But for the moment back to measurements. For now we will just concentrate on Mercury and Mars. Can they show us the ratio of any meassurement systems we use. What do you think ? Do you think I can show you that they do indeed show us and to a degree of accuracy you will find hard to believe. However it is where I found this little trick that is so profound. I found it where I found most of my discoveries and that was on the barren plateau in Egypt called ... The Giza Plateau and those three incredibly encoded structures referred to as The Pyramids of Giza. Now I don't know if you are amazed by this but you should be. I will now show you how it was first discovered by Nick Lievense a genius, but I don't think he knows it yet. Now I have contended for quite some time that not only is The Great Pyramid representing The Earth but it is also representing Mercury and here is the first of the proofs I will offer. Now there are probably millions or maybe countless numbers that will satisfy this equation but only one series that I have found at Giza and they are so in your face you will find it hard to believe you missed it before. Okay so now it's time to introduce those giants of construcution wonders, The Pyramids at Giza. And with the measurements marked. and this last one for now. This is the beginning of the proof I will offer that The Great Pyrmaid is indeed meant to represent Mercury. After this opening I hope that what follows will be a little easier to accept. I hope you approve Nick ! Cheers and much more to follow. From Whence Comes The Measurement ? Carol Behan: If you play around with numbers for any length of time, you can get any correlation you want. That doesn't mean you've proved anything, though. This is exactly what Ahatmose was doing for years on end in his posts - wasting years of his life on trying to piece together futile correlations. How dare I. How dare I try to find an answer on the other side of the box which most of humanity has been locked in. How dare I try to find answers in all the most illogical places. Imagine looking for answers within one of The Creator's most eloquent creations ... The Solar System ! But you know what not once did I take credit for any of my discoveries. I never once said it was my own. No every single time I gave credit where credit was do and that belonged solely with those incredible entities (human or otherwise) who built The Giza Pyramids and already had it all encoded. I simply found a key to unlocking part of it. My numbers fit almost to perfection. Not 94 or 95 or 96 % but almost always to at least 99.98 % accuracy or better, yet still my work is ignored or I really should say their (The Ancient Builders) work is ignored. I honestly have to laugh when my detractors choose to try to tell me that the measures came from the thumb and the foot and the span and the digit and yet are so blind to expand their thoughts just a little and try to take into consideration that yes although these simple tools do work the Creators who "created" man to certain specifications, I believe in "His" image it is said, had first built The Heavens and our Solar System. I would like to ask a simple question here. If "The Creator" used "himself" as a guideline for Mankind does it not seem perfectly logical that "he" would have used the same blueprint to define the heavens and most certainly The Solar System and with that thought in mind let us move forward. But be forewarned this may be a waste of your time and your life and you obviously have so much more and better things to be doing. Nick L. was a person who arrived out of nowhere over at Graham Hancock's Message Board and for some insane reason took to my postings with a passion. He took my short little pass of an idea and turned it into the greatest of touchdowns and what he discovered or really rediscovered or maybe even co-discovered with me (it gets murky here and is really not important) is astounding and if a big name author had come to these conclusions it would have been everywhere for people to see and talk about. 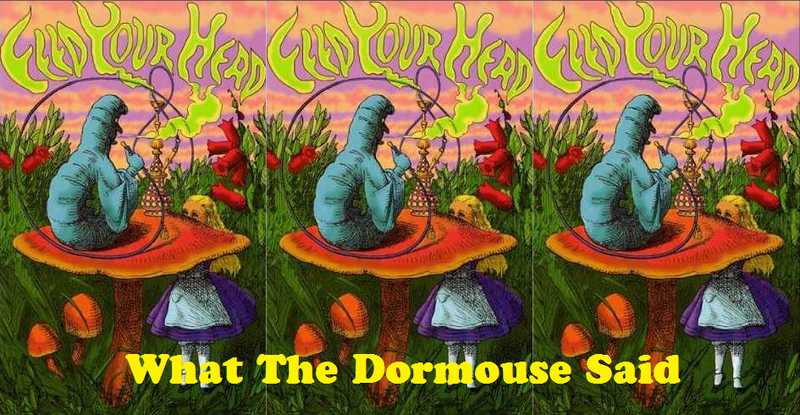 But alas it fell to a Grade 12 dropout to figure it out and take an early pass from the greatest thinker at Giza ever to be seen or likely ever to be seen again, The Late Clive Ross, and with Nick L. help turned it into a truly noteworthy discovery. But it continues to be ignored and this is fine I guess but it is simple and amazingly accurate. It is there to be checked and it is simply ... The Truth. 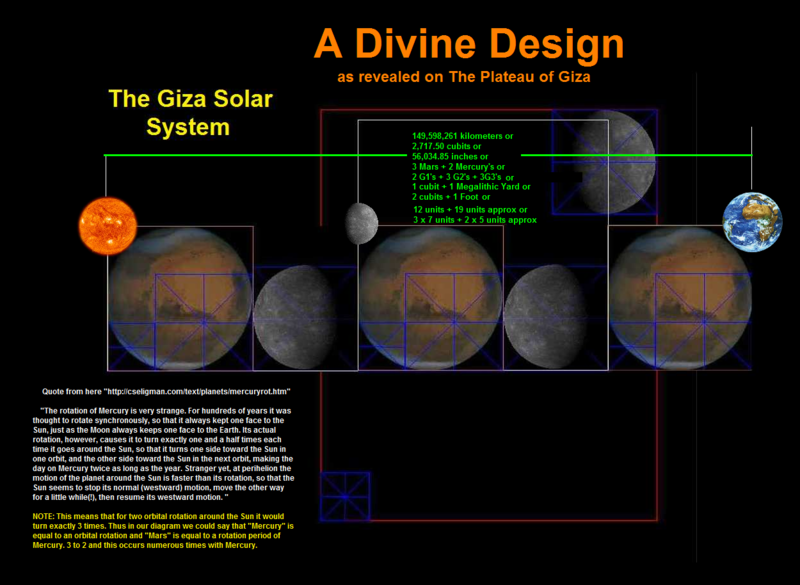 I have done an awful lot of research at Giza and I dare say few (DUNE being a notable exception) know the measurements of The Giza Plateau as well as or better than I do. But what makes my research so different ? It is simply that I feel that all of the measurements of humanity were first manifested and derived within and from The Solar System and gives a clear and concise meaning to As Above ... So Below. Also I would be remiss if I didn't mention The late Alan Bennett and his website Solar Geometry: A Case for Divine Design of the Solar System which was also a wonderful encouragement for me. Did he waste his life as well Carol ? Before we move on there are a few facts that need to be agreed upon and are in the scientific community and these are the semi-major axis of the planets. The semi-major axis is simply the average distance a planet is from The Sun and is arrived at by taking it's closest approach to The Sun added to it's furthest distance away from The Sun and simply then dividing the result by two. As an example let us use Mercury. It's closest approach to The Sun is 46,001,200 kilometers and it's furthest point away from The Sun in it's orbit around The Sun (all orbits being elliptical) is 69,816,900 kilometers with the average of the two being 57,909,050 kilometers. Let us put them in a chart format. For this posting I am only going to be dealing with the four inner planets, Mercury, Venus, Earth and Mars. It is my contention that within the measurements of these four planets can be found the relationships between The Foot, The Meter, The Cubit and best of all The Megalithic Yard. So on to the planets. To see the source of my figures click on the links in light grey. Here are a series of images to show you the values. Okay now we have to figure out the ratios of the major measurement systems that are used today and have been used in the past. Let's list them. The Foot, The Cubit, The Meter and one that not too many agree is even a measurement, The Megalithic Yard. In order to compare them we need a smaller agreed upon distance that can be divided into each of them and for that we can use the lowly inch however it could be anything smaller as it all is simply a ratio. 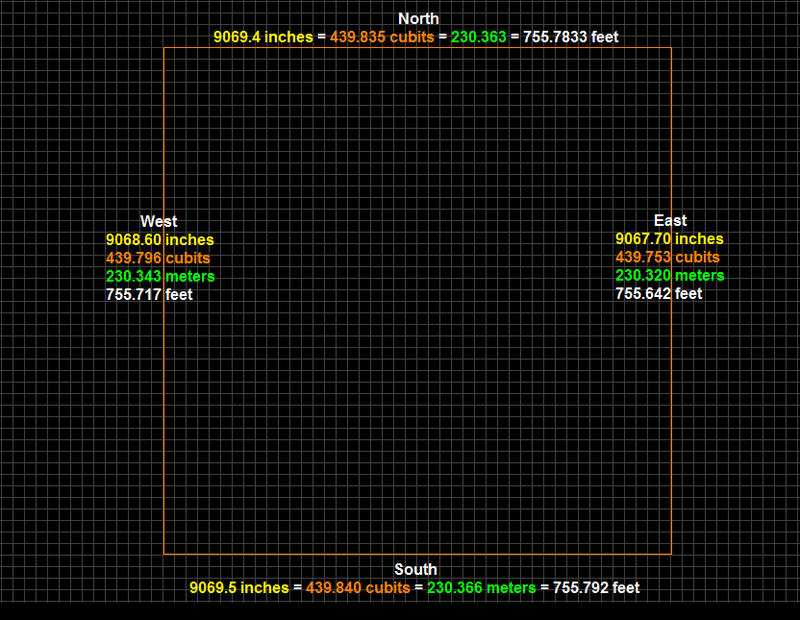 Below is a chart to show how many inches are in each unit of measurements. Observe. No tricks. No gimmicks, nothing that can be argued with. These are the cold hard facts concerning the measurement we use to day. I am going to highlight a couple of them because we will be returning to these ratios. So now let's combine what I have written above with what is in the chart and lo and behold we get this diagram. They check for an accuracy of 1.9093151668 / 1.9095820636 = 0.99986 or 99.986 % accurate. 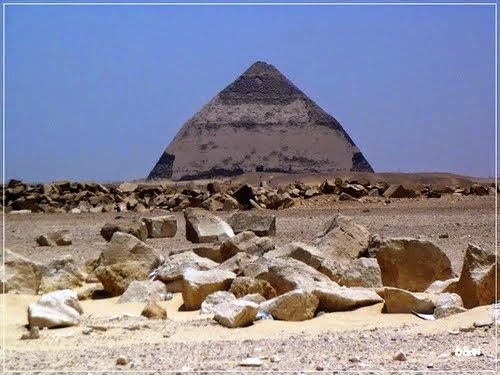 Well here we are at Dahshur and for those who have lived in a bubble and do not know what The Bent Pyramid looks like here is a picture of it. 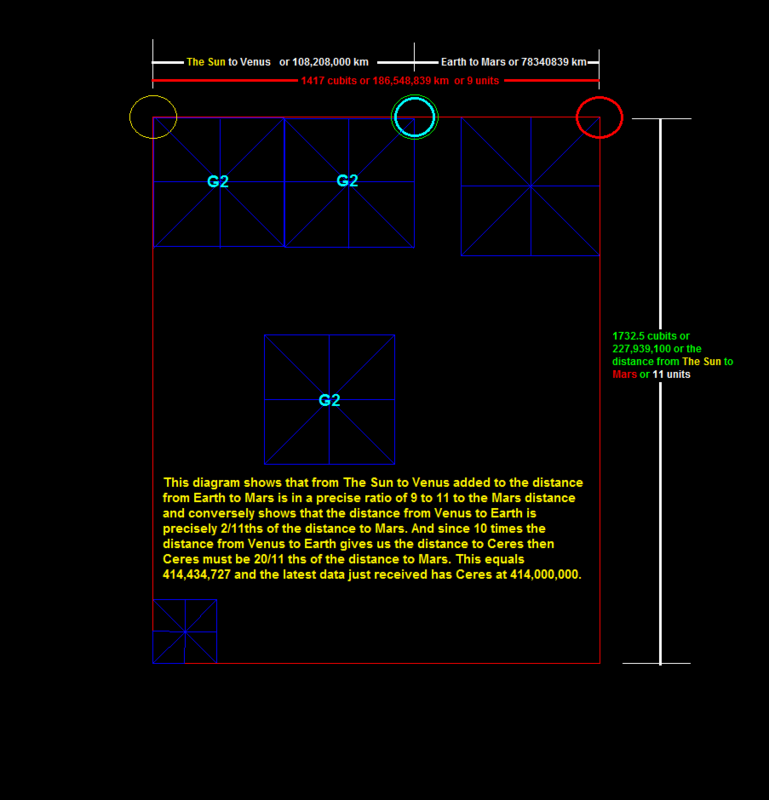 As you can see there appears to be two pyramids and here is the sketch we will be using. 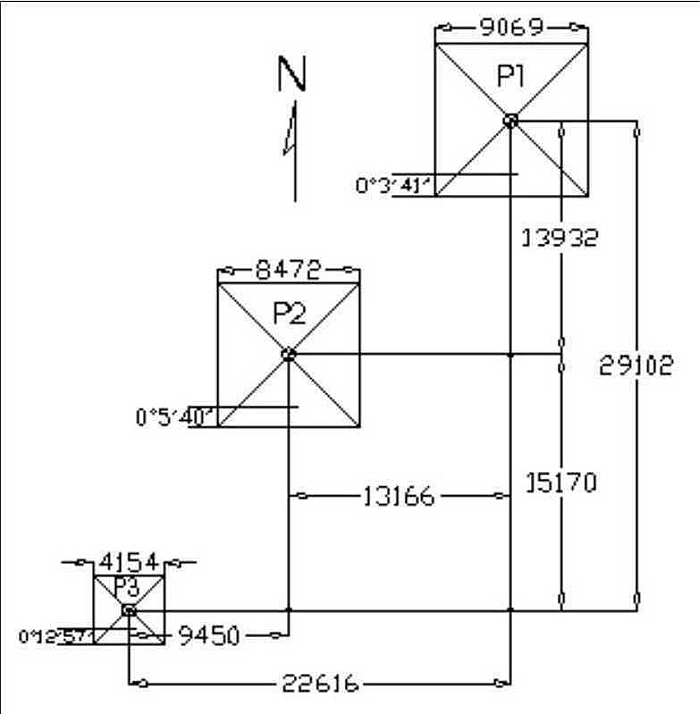 John Legon did a lot of great work on these things in the mid 80's but his main fault I feel is that he insisted that The Giza Plateau was in the ratio of the square root of 2 to the square root of 3 rather than trying a more simple and accurate 9 by 11 rectangle. It is because of this fact that most of his work at Giza is in error and does not fit. 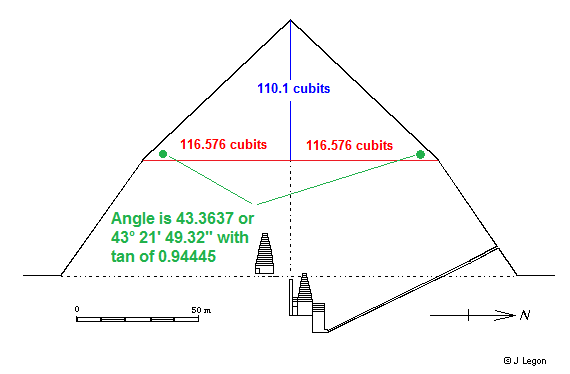 If we allow 20.62 inches to a cubit then The Giza Rectangle works out to be 1417.5 cubits wide or 29228.85 inches by 1732.50 cubits or 35724.15 inches. These are the facts and the distances as presented by Petrie and I am not sure why John would have insisted that they were not correct. Maybe I will ask him. Anyway after experimenting with 110 for the top and 90 cubits for the bottom pyramid height I finally decided to take the advice of John Legon and use 110.1 cuibts for the upper height. Here are the break downs according to Petrie and Dorner. Again borrowing from Johm Legon's website. Let us look first at the break downs for the two heights. 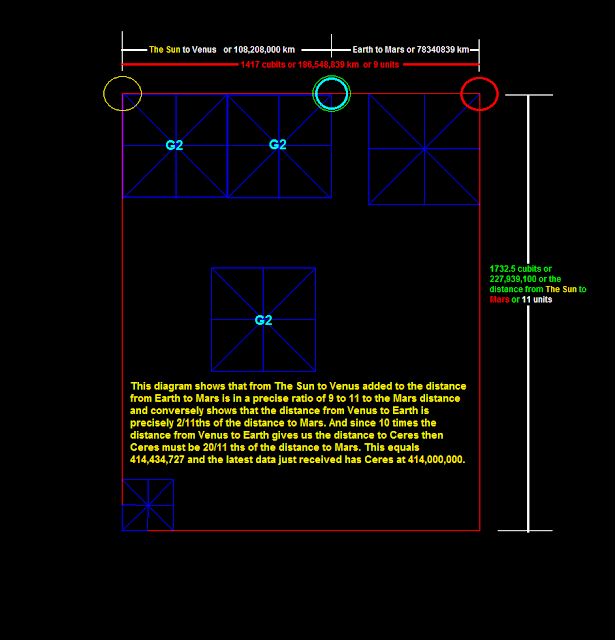 But before we do any of this we have to decide on the angle of the upper portion and so I am going to go with The Master Builders and use the angle they left us at Giza of 43.3637 and the tan ratio of 0.94445 . So to start with let us assume that they copied (oh wait they were first) , that they used for a top height the distance of 110.1 cubit what would that give us. Well it reall is a simple matter. one only has to take 110.1 and divide it by 0.94445 to get 1/2 the base of the upper portion and thsi gives us 110.1 / 0.94445 and equaling 116.576 and tiems 1 we have a base of 233.152 cuibts for the upper base. Here is a diagram to illustrate this. And finally showing the contained angle. Just a note here that we match Dorner measurement of 110.11 within 1/100th of a cubit. Keep that in mind as we solve for the bottom angle and distance. of base. Equatorial radius of Moon = 1738.14 km (0.273 Earths) x 2 = 3476.28 / 1.60934 = 2160.07 Scoring an absolute direct match. 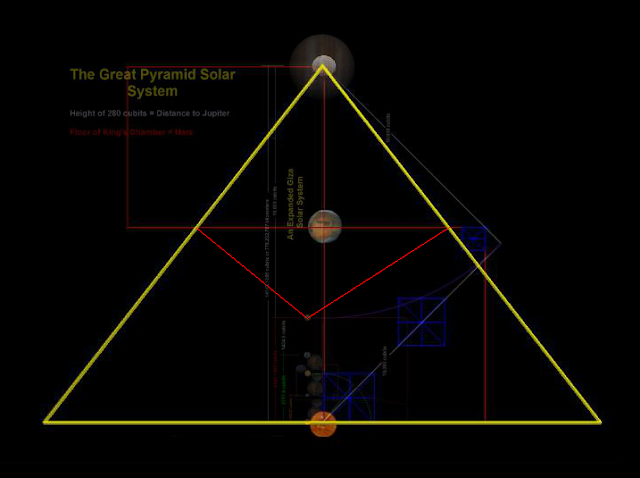 SO IT WOULD APPEAR THAT THE RELATIONSHIP BETWEEN THE SUN AND JUPITER OR MAYBE HORUS AND SET VERY MUCH FIGURES INTO THE SIZES OF THE VARIOUS COMPONENTS OF OUR SOLAR SYSTEM ! Hi all. Well to say I have been busy would definitely be an understatement. I have been working on a few projects such as figuring out how to tell angles using just the pyyamids (it is quite easy once you know how) and figuring out the connection between the pyramid fields at Giza and at Dahshur which is what this posting is about. Now this is extremely convuluted and I will try to make it as easy as possible and for those who are mathematically and geometrically challenged I apologize for this is quite a lot to handle but also quite elelgant and beautifully simple. Most researchers including myself have spent their lives studying The Giza Pyramids and have basically ignored the pyramid field at Dahshur which includes The Red Pyramid and The Bent Pyramid. I think it is partially because data for these two pyramids are not as easily found yet I think I have finally deciphered the true measurements and it is quite elegant. First of all I would like to state that I have had 9/11 on the brain and kept thinking that The Bent Pyramid had to be in an 11 by 9 ratio, that is the top was 11 units and the bottom 9 units. 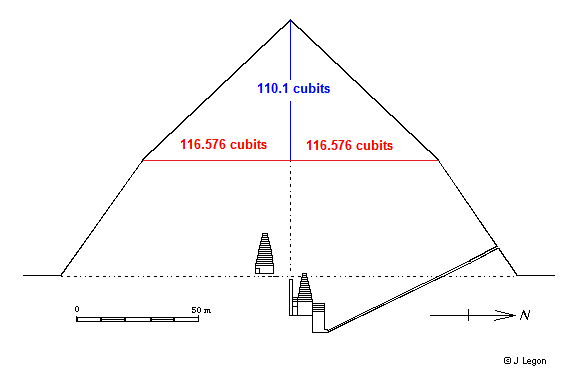 However there was one thing that kept nagging at me as I went over and then worked on overhauling my theories on The Bent Pyramid and this was the single fact that at Giza the distance from the north face of The Great Pyramid to the south face of G2 was not 1100 cubits as one would have expected but was 1101 cubits ! John Legon used this fact to conclude that the top portion of The Bent was not 11 units but actually 1101 or not 110.0 cubits but 110.1 cubits. I kep thinking he was wrong but the more I looked at it the more I came to realize that yes this was indeed the same measurement and was probably meant to be the same and then I wondered well maybe there would be other matching similarities as well and so for the very first time I decided to try to tie in my measurements at Giza to what I knew of Dahshur and The Bent Pyramid. It was an amazing ride. 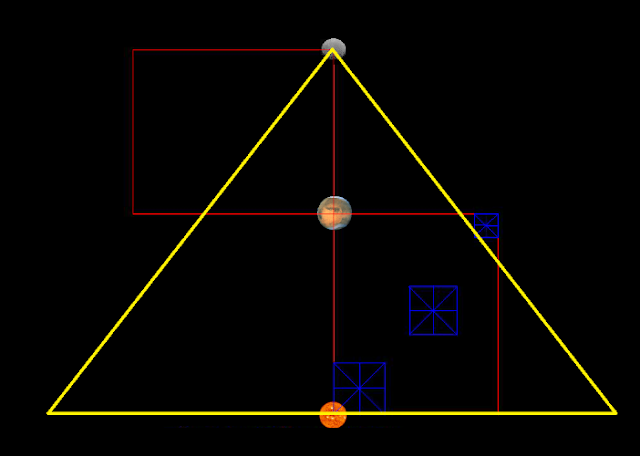 I found it hard to believe that to solve for The Bent I had to start at Giza but that was how it turned out. Firstly I think I need to post a map of The Giza Plateau with the measurements we will be using. It is an abridged version of Petrie's diagram with adjustments made to make the south side of The Great Pyramid run directly east-west. I will post both for you to compare. Now I had in past research realized that the angle formed from a line between the centers of G1 and G2 gave us almost the same angle as at The Bent (upper portion) but I had been unable to do anything with it. This was to change quite dramatically this time around. 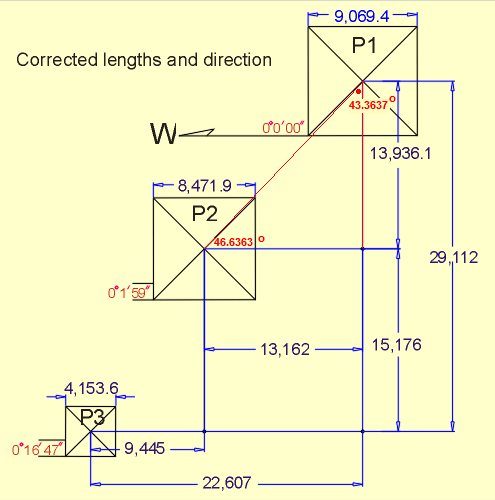 I am not going to post a bunch of references but suffice it to say that the concensus of the angles for The Bent have the top portion at around 43 degrees 22 minutes while the bottom ranges from about 54.3 to 55 degrees. Below I have joined the centers for you and have marked in the angles for you to see. Observe below: We get 43.3637 and 46.6363 as the two angles and that is the beginning of a very strange voyage we are about to take and when it is over I hope you will see the pyramid builders in a completely new light. Okay it is Thursday morning Nov. 6th and onward we go. Now what led to this latest round of insights was the fact that I chanced upon a diagram I had made around a year ago and although I thought it unique I did not pursue it. Here is the diagram from around September of 2013. So I took this diagram below and did the same thing. Now some might wonder how I figured out the angles on the diagram above but it is really quite simple geometry and trigonometry. In any right angled triangle the small side divided into the large side (not the diagonal) will yield a ratio or a number and this is called the "tan" of the angle in question so dividing 13162 by 13936.1 will give us the tan of the angle and the ratio turns out to be 0.9444536 and this is precisely what the distance is from the center of G2 to G3 along the horizontal multiplied by 10,000 ! Now I mean really think about that for a moment. 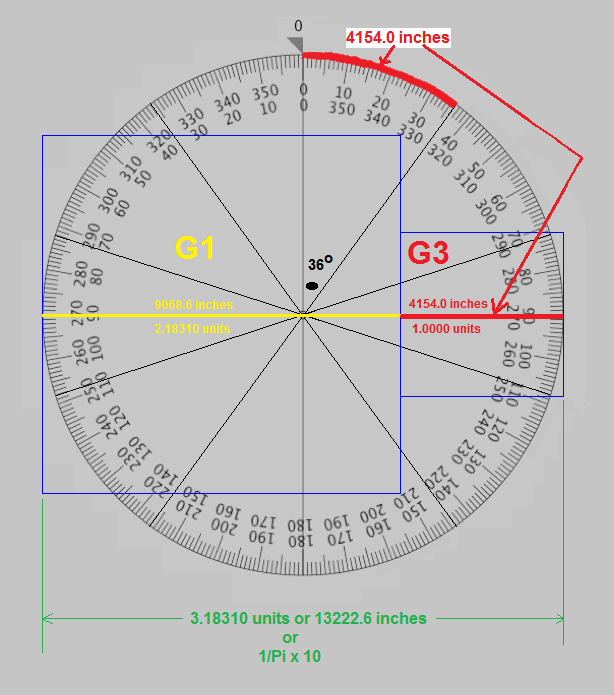 Of all the measurements that randomly could have resulted from placing G3 on the plateau what do you think the odds are of placing it precisely 10,000 times the ratio of the distances between G1 and G2. Now we have met 10,000 here at Giza before when we realize that The Great Pyramid is representing the square root of 3 and the height of this pyramid in inches is precisely, or was projected to be, the square root of 3 divided by 3 times 10,000 and we get 5773.50 inches. But after coming to terms with this latest coincidence one then would need to try to explain the following. What follows was pointed out by me last year but it is within a better framework that I offer it this year. There have been many arguements on whether The Ancient Builders knew Pi and/or decimals and all I can say is how the heck could they have left the distance between G2 and G3 the exact DECIMAL VALUE or ratio of the distances between G1 and G2 if they did not know decimals ? I mean really how long can "they" keep yelling ... COINCIDENCE ! There are 4 different measurements at The Great Pyramid for the sides and as I have suggested in the past this is becasue I feel that there is probably at least 4 different solutions But let's deal with just one scenario. Let us assume that The Pi angle was meant and used here at The Great Pyramid how would you prove to vistors to your pyramids that you had used Pi espeiclaly when 5.5 by 7 and Phi were so close. So how would you do it ? Well I am going to show how The Master Buidlers showed us ! So let us start with the mean and round up to 4154 inches. If we add this to G1 we get G3 + G1 = 4154. + 9069.0 = 13223 inches and would it not be somewhat convincing if this number in some way showed us Pi given the numbers we have already been using well how about this. 4154 / Pi = 1322.26 this checks to 4/10ths of one single inch and has convinced me that they intentionally encoded their understanding of this ratio. But as always at Giza there is always one more proof and so I offer this. One of the sacred measuremtns used at Sakkara for their arches or curves was the ratio 0.7 or 1.4 ratio and so what do we get when we use 4154 and 1.4 with a little help from our friend Pi ... do I really need to do the math ... well it is none other than [(4154 / Pi) / 1.4 = 944.47 and again showing us our angle tan decimal of 9445. So what we have is G1 + G3 equal to 1/Pi x 10 or 3.183098862. If we allow this then G3 is equal to precisely 1 unit and G1 is equal to [(1/Pi x 10) - 1] or 2.183098862 and that is indeed what the numbers work out to. Are these just more coincidences ? I think not. In order to be a perfect fit we would only need 2/10th of an inch or 9069 / 2.183098862 or 4154.19. Proof I would suspect of intent. But we are not nearly done yet. 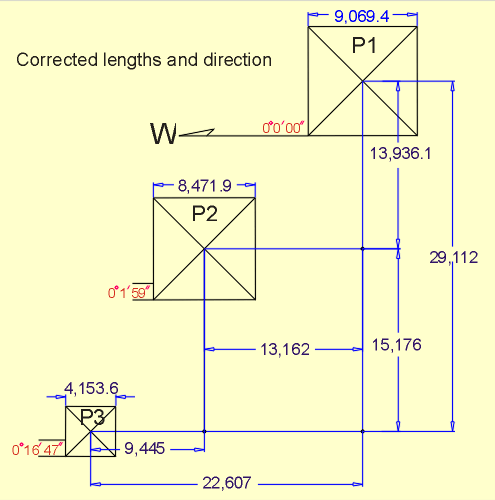 Here is a diagram that illustrate this concept a bit better using 9068.8 and 4154. But wait this post is supposed to be about The Bent Pyramid at Dahshur so maybe we should head on over there. see you there in a while ... to be continued. Part II: Cubes and roots and squares, oh my ! Hi all please read Part I first. 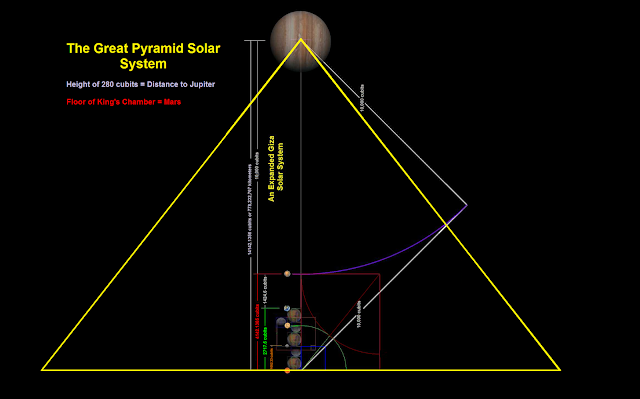 In Part I it was shown by me how the AVERAGE speed of Neptune around The Sun was in the ratio of "the cube root of 1/2 the diagonal of The Great Pyramid (622.00 / 2) divided by 100 or 3.11 when we use the perfect measurements to show Pi of 439.82 for the base and 280.00 for the height . So I had a thought maybe ALL the planets were at a cube root of a number that we would find significance with and so I tried another planet and so I tried the one furthest from The Sun and that would be Pluto at about 5.874,000,000 kilometers from The Sun on it's semi major axis. I wondered could this give me a number that was important so I started trying "things" and came up with this marvelous solution. In books and online the suggested average speed of Pluto is anywhere from 4.67 to 4.7 ( I would guess that the latter was rounded) and that would give Pluto a ratio of Earth's speed of 29.78 / 4.67 or 6.37687366167 to 1. So in keeping with our theme I decided to cube this value to see what I would get and arrived at this number: 6.37687366167 cubed is 259.31249186591 but I have learned not to trust measurements online and so going to my elliptical measuring site I found out that the actual distance traveled by Pluto in a year is 36,348,870,300 kilometers. Now to calculate average speed we simply need to know how long a year is and we find two values for the year on Pluto. The first is "the sidereal orbital period" and this is 90,465 days while the second is "the tropical orbital period" and this is 90,588 days/ so now all we do is divide 36,348,870,300 kilometers by 90,588 / 24 (hours) / 60 (minutes) / 60 (seconds) and we get 4.6441528388 if we use 90,465 we get 4.65046722336. If we use the latter we get 29.78 / 4.65046722336 or 6.4036576476490935125430844545394 and this number cubed is 262.59371 (very close to the height of The Great Pyramid now and many feel that this is as high as it got) but the real numbers I am looking at are 6.3972269796157684960801651350896 and 4.6551420005717308801570872085312 for 29.78 / 6.3972269796157684960801651350896 = 4.6551420005717308801570872085312 okay be why 6.3972269796157684960801651350896 well this number cubed is Phi squared x 100 or 261.803398875. So is the ratio of Pluto's average orbital speed to that of Earth's in the ratio of 1 to the cube root of Phi squared x 100 ? I was about to close this posting when I decided to see what the actual radius would be with our values for Pluto and got these values. For 36,348,870,300 if this was a perfect circle the radius would be 5,785,102,384 and if we used the number we got when we used Phi squared x 100 cubed then cube rooted we get 36,385,409,181.5 as the perfect circle and radius would be ... 5,790,917,728 and if we divide by 100 we get 57,909,177.28 and we have to be amazed that it is almost precisely the semi major axis of Mercury of 57,909,050 or an accuracy rating this time of 0.9999978 or about 1 in 22/10 millionths ! (22/10,000,000). So in other words we now have this solution for the orbital distance of Pluto. Actually quite easy to remember and quite brilliant as well. We simply use the semi major axis distance of Mercury (and how many times have I tried to tell you that Mercury is the messenger of the information of the gods ?) as a radius and simply calculate for circumference and we get 57,909,050 x 2 x Pi x 100 to get 36,385,329,211 and Phi squared x 100 cube rooted yields 36,385,409,182 simply amazing ... don't you think ? But there is still a bit more and I will continue with a solution for Eris and an explanation (maybe) for the outer reaches of our solar system and The Oort Cloud in Part III of Cubes and roots and squares, oh my !